Today is Equal Pay Day, the day that the average woman in America has made as much as the average man did last year. With women earning anywhere from 60 to 80 percent of what white men do, our fiscal year needs extra months to make up the difference. 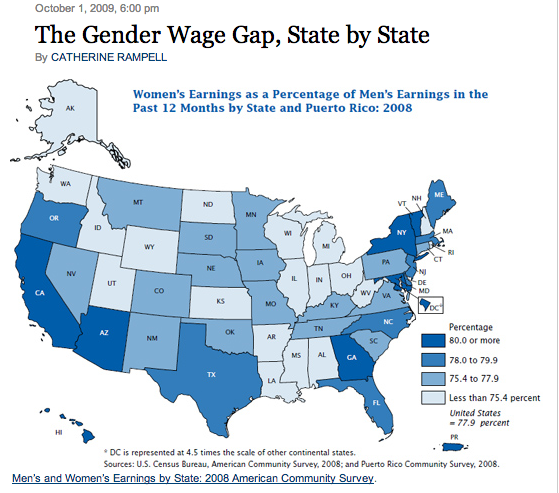 However, some people continue to argue that we don't have a wage gap. 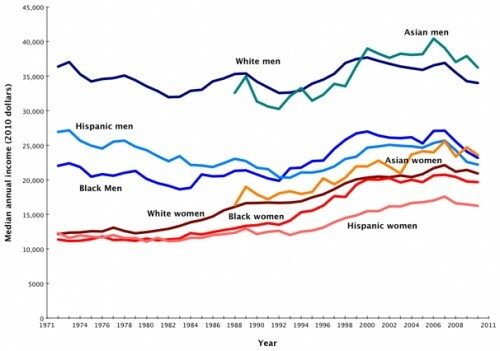 Instead, the discrepancy in wages between white and Asian men and all other people in America is due to motherhood. But all sorts of statistics pin the blame on far more sinister foes than babies: Looking at the hard numbers, it's undeniable that racism and sexism are a core part of American economics. 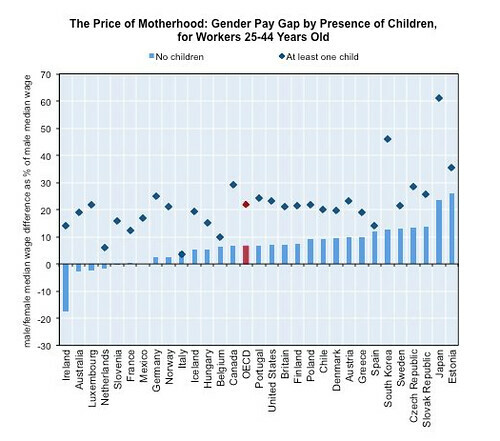 Check out these ten graphs showing how motherhood is not solely to blame for the wage gap. 1. Having a kid definitely does impact a woman's wages—but the impact isn't the same in every country. Each new kid lowers a woman's salary by 5-7 percent in America but parenting policies—like our lack of maternity leave and child care—impact income differently in each country. 2. The percent of mothers making more money than their husbands has increased dramatically. 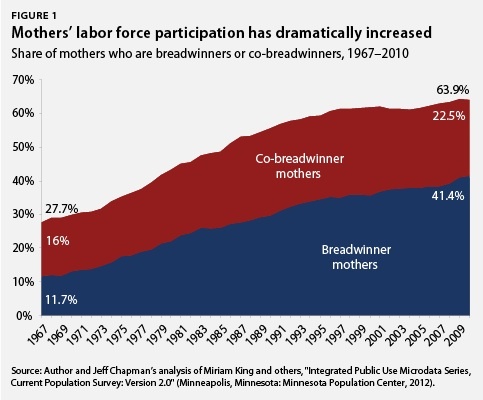 Since 1967, the number of mothers making more than their spouses has tripled. There's something going on here that doesn't just have to do with babies. 4. … but it doesn't line up with birthrates. This is another sign pointing to the fact that the wage gap has to do with more than whether a woman has kids. 7 and 8. 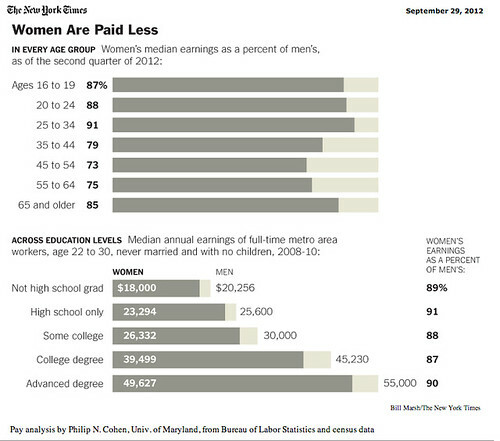 Regardless of age or education, women earn less than their male peers. Like motherhood, age and education have an impact on earnings but are not the sole explanation for the gap. Even the best-educated workers in their prime working years earn less than men. “Among never-married, childless 22- to 30-year-old metropolitan-area workers with the same educational credentials, males out-earn females in every category,” reports the New York Times. 9. 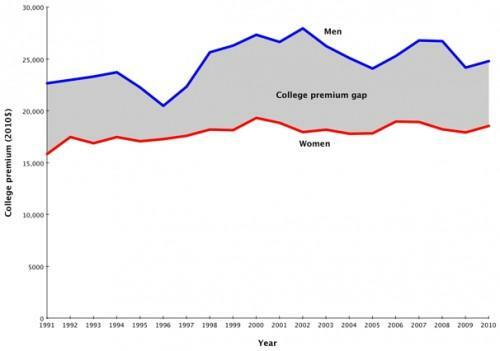 A college education helps both men and women earn more—but women are still paid less. 10. In addition to race, education, and age, the field of a person's employment affects their income greatly. Clearly, you can't blame the wage gap just women's propensity for baby-makin'. Underlying the wage gap are big issues about what industries disproportionately employ white men, barriers to wealth accumulation, access to higher education, and straight-up racism and sexism. 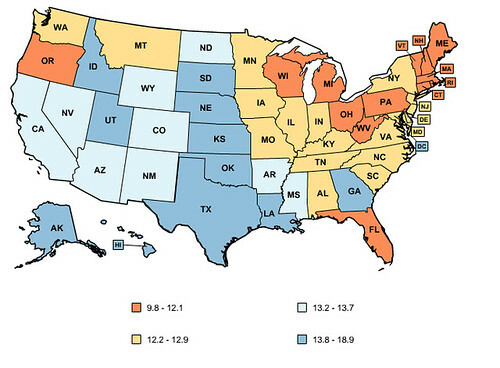 Read this next: How Big Is the Wage Gap In Your State? Dollar image courtesy the National Women's Law Center. This post was updated with an additional graph on April 8, 2014. The Construction Industry is more fair? Am I reading the ninth chart correctly? 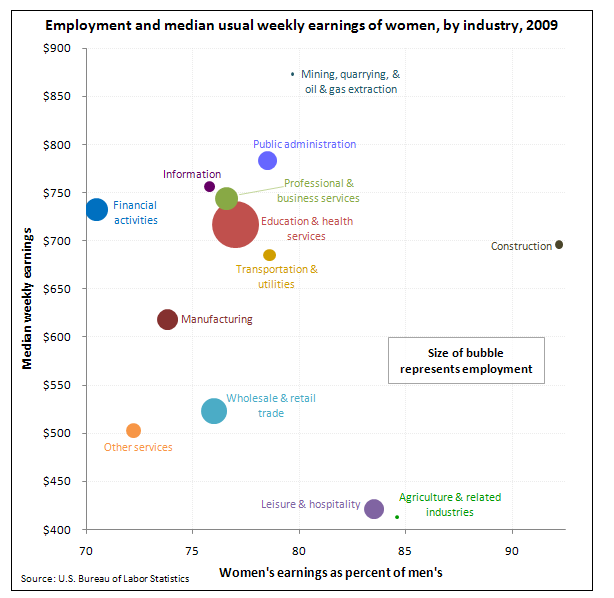 There is greater parity in construction between men and women, but one of the worst (most unequal) sectors is financial services? Construction related wages are frequently governed by union rates whereas financial services, and many others, are not. I've read your article, printed it out and inserted into a book I'm reading currently. You're probably familiar with "Women don't ask" by Linda Babcock and Sara Laschever. It researches the same issue: women are underpaid in comparison to their male coworkers. The researchers say it's because - apart from what you mentioned in your article: sexism we encounter - we also don't ask for more than we already have, we constantly undervalue our hard work and contributions, and we are more "uncomfortable" to enhance our job satisfaction actively (vs. passively wait to be noticed and a promotion or raise to come to us). 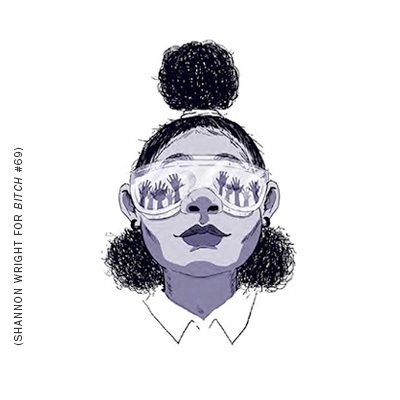 The reasons of that are scary: it's how we are schooled as children (at home: toys, allowance, school: girls can't be good at math, media such as cartoons or stories: female characters patiently waiting to be saved by male characters, to name a few). We are taught to follow gender-appropriate behaviors and stay passive, "for the people" (care taking of others) or dependent. It is so deeply imprinted into our socialization that by the time we grow up, we believe these are simply our unique traits! As scary as it sounds, I like the message this book sends: we CAN DO something about it. It's time to start asking! Start negotiating our salaries, raises, promotions, working conditions, household responsibilities. I challenge you all to define what you want (make, have, do) and ASK FOR IT, because 75c to a dollar is not how we want it to be! I asked for it. I was treated like a hysteric. because we all know what happens when women asser authority or power or act like a man. I don't doubt that their is a wage gap but I think it would be interesting if there are other factors like amount of past experience (years), years at current company, as well as average overtime worked per year. I think looking into these factors would be helpful either way by dispelling this common rebuttal or finding out it is true so we can work on the disparity. "Because female power is assumed to be beauty, and female beauty is latched tight to youth, our power is believed to fade over time."